Winter has arrived in Melbourne, and it is COLD, REALLY COLD! 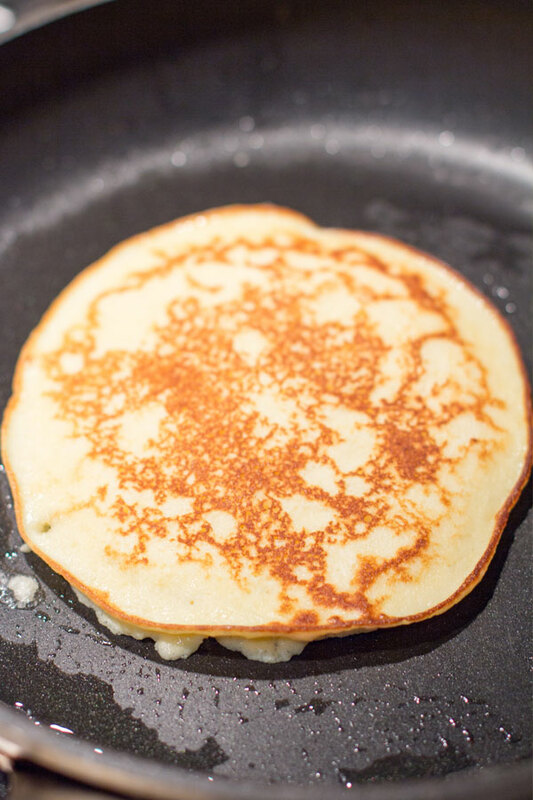 And while coconut might not be quintessentially winter, there is something about this coconut flour pancake recipe that seems perfect for a winter breakfast — enjoyed in my slippers and PJs, of course. To be honest, I never order pancakes when we go out for breakfast. 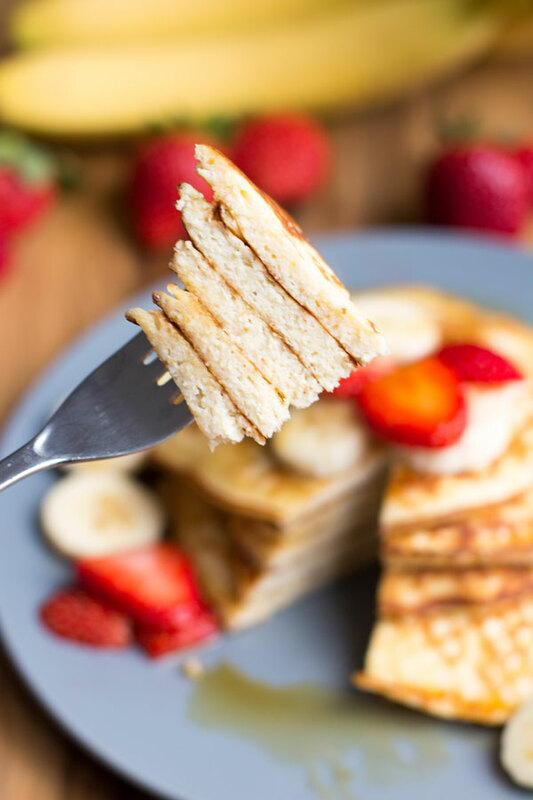 I’ll almost always choose something else — But for a quick and easy home cooked breakfast it’s hard to go past these fluffy coconut flour pancakes. This recipe is a great example of a new twist on an old classic. I don’t know much about its health benefits, coconut flour, but has a unique, nutty flavour making it perfect for pancakes. Fluffy, light, and slightly powdery they have a unmistakeable coconut flavour. Your pancakes shouldn’t be too large as they can be difficult to flip as they are slightly more delicate than traditional pancakes. They cook quickly, so keep a close eye on them to make sure they don’t burn. 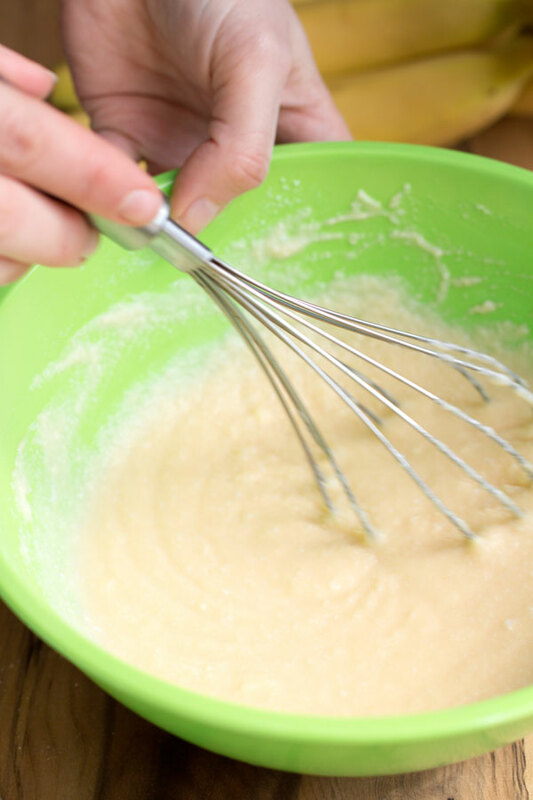 Adding extra eggs in the batter help the pancakes hold together. 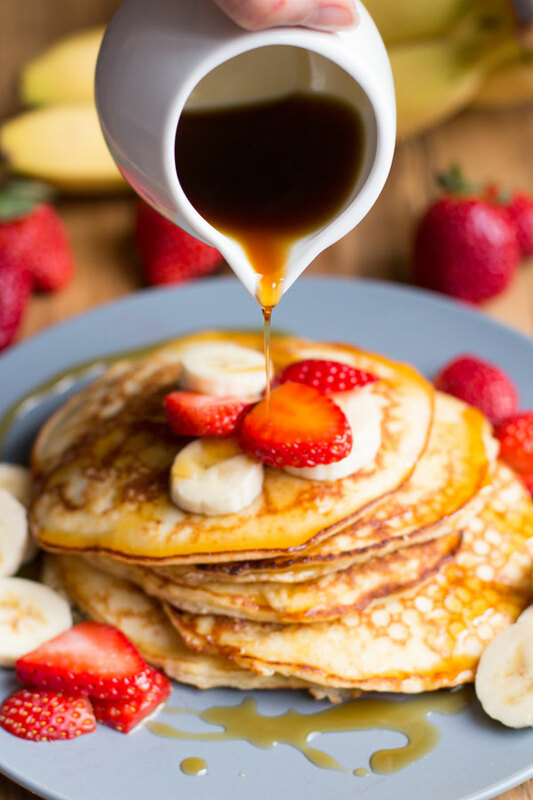 We like to top our paleo coconut flour pancakes with fresh strawberries, banana, and a generous drizzle of maple syrup. If coconut flour pancakes are not your thing then check out our recipe for Spanish baked eggs or easy lemon curd. 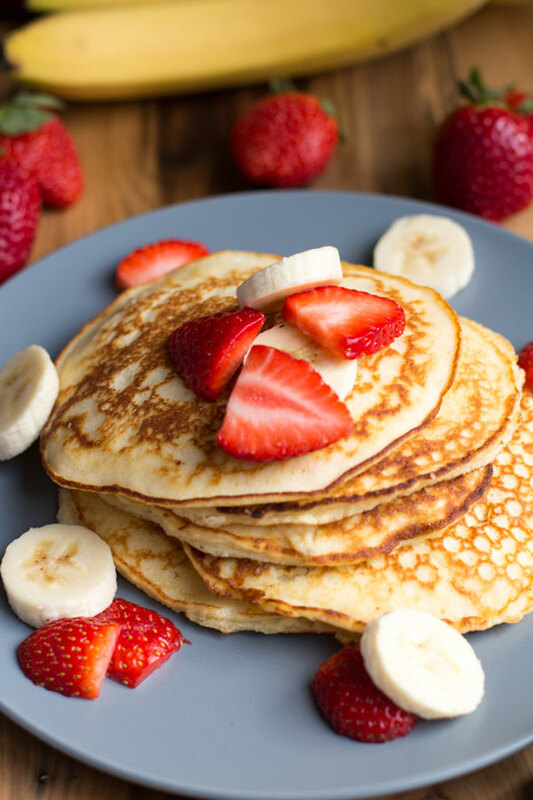 Paleo coconut flour pancake recipe with fresh strawberries, banana, and a generous drizzle of maple syrup. Melt coconut oil in a small saucepan over low heat just until it became a liquid. After letting it cool a minute or two, I then added it to the wet ingredients. 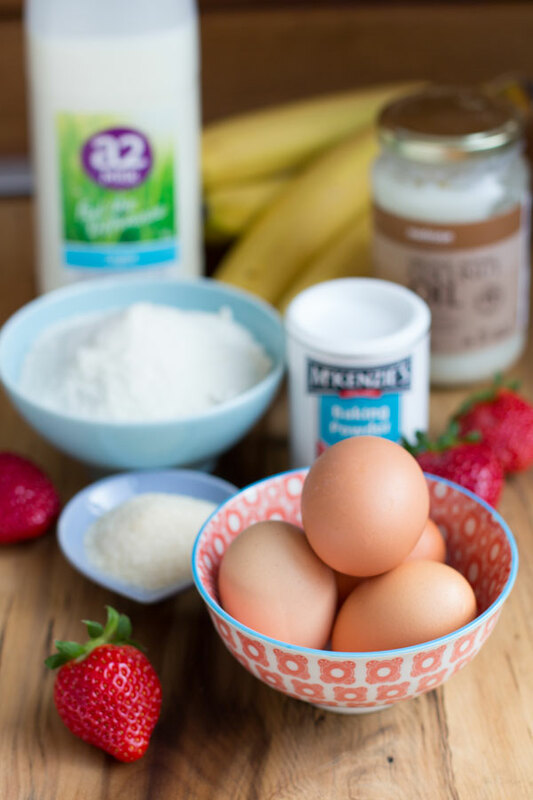 In a large bowl, whisk eggs, milk and oil until combined. In a separate medium bowl, whisk coconut flour, sugar, baking powder and salt until well blended. Add dry ingredients to wet ingredients; stir with a fork until well combined and no lumps remain. Grease griddle or skillet with oil or butter. Drop ladlefuls of batter, a scant ¼ cup each, onto hot griddle. Cook 3 to 4 minutes until small bubbles begin to form on top, then flip. Cook on other side 1 to 2 minutes until cooked through. Serve warm with your favorite pancake toppings.